Researchers increasingly use digital facsimiles of primary sources to conduct their research. But how do these images shape, limit, and expand what we can do with the works we study? This tutorial will focus on exploring the affordances of various digital facsimile resources (including subscription services and open access platforms), examining not only how digital representations of objects differ from their analog counterparts, but also how the structures of metadata and licensing affect their discoverability and usage. The workshop will use EEBO (Early English Books Online) and ECCO (Eighteenth Century Collections Online) as exemplars for this sort of work but that this general approach to working with digital facsimiles will be relevant for other periods as well. 1. How are you accessing EEBO and ECCO? 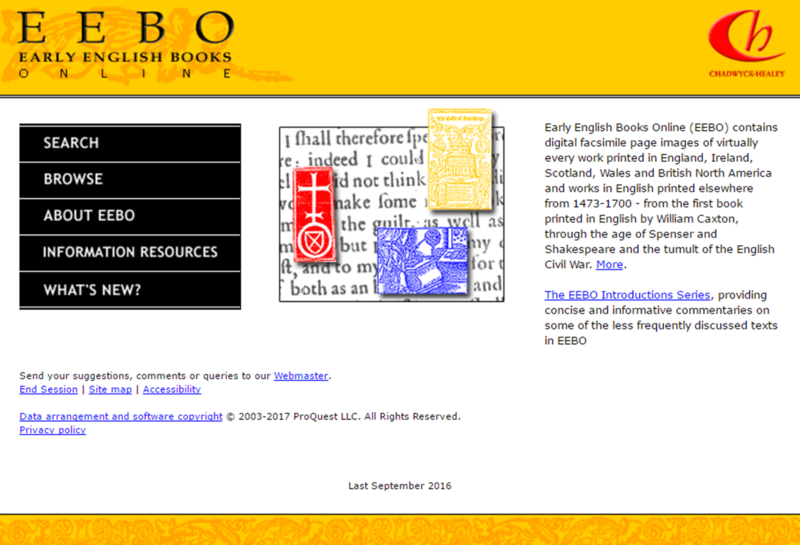 EEBO and ECCO are accessible only through an institutional subscription. There are a couple of different providers to the databases. EEBO can be accessed at https://eebo.chadwyck.com, an interface created by Chadwyck-Healy (how most users in the United States use it) or through JISC’s Historical Texts collection, http://historicaltexts.jisc.ac.uk (how many UK users find it). ECCO similarly can be accessed through its native interface provided by Gale (http://www.gale.com/primary-sources/eighteenth-century-collections-online) or through the Historical Texts site given above. The general functionality remains the same, regardless of access mode, but some of the specifics of searching and metadata availability differs. If your institution subscribes to EEBO or ECCO, you should be able to find it in your library’s list of databases. If you are usually logged into your institution via a proxy, you will probably be able to open up EEBO and ECCO and immediately begin using it. In other cases, you will be prompted to provide your credentials (usually after you click on the database link your library provides) in order to be able to start. This is a bibliographic number. You’ll often find references to STC or Wing numbers when working with early modern printed texts; those catalogs serve as a handy way to keep editions apart. In the Chadwyck-Healy interface, you can search in the bibliographic citation field for “STC and 22273” or for “22273.” (It’s easy to forget the “and” between “STC” and the number, but if you do, you won’t get any results.) 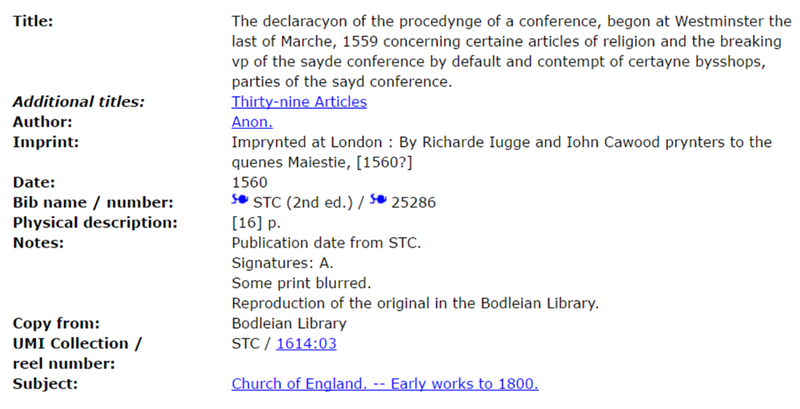 In Historical Texts, you can simply search the bibliographic number for “STC 22273. In the advanced search of the Chadwyck-Healy interface, there’s an option to limit your results to a list of libraries who have provided images; if you scroll down that list to the library you want, select it, and then do a search, you’ll get all the images from that library. Note that the Historical Texts interface does not have this option. Now that you’ve got the basics down, let’s see how hard it can be to find things in EEBO. Can you find the following? The first work is given by the name by which we usually refer to it; the last is a format that books were often printed in. 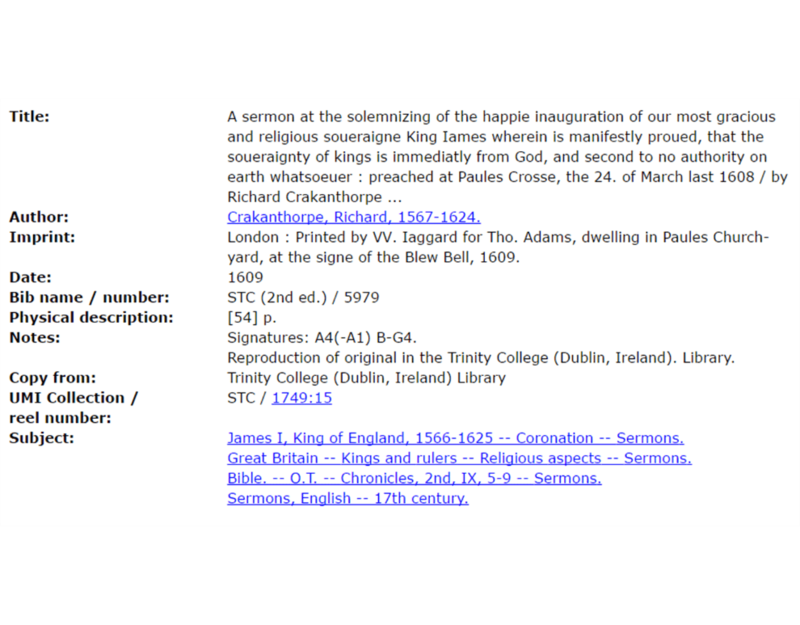 Searching for “King James Bible” won’t bring this up because that isn’t the title and James isn’t the author: he commissioned it, so we associate it with him, but he didn’t write it. 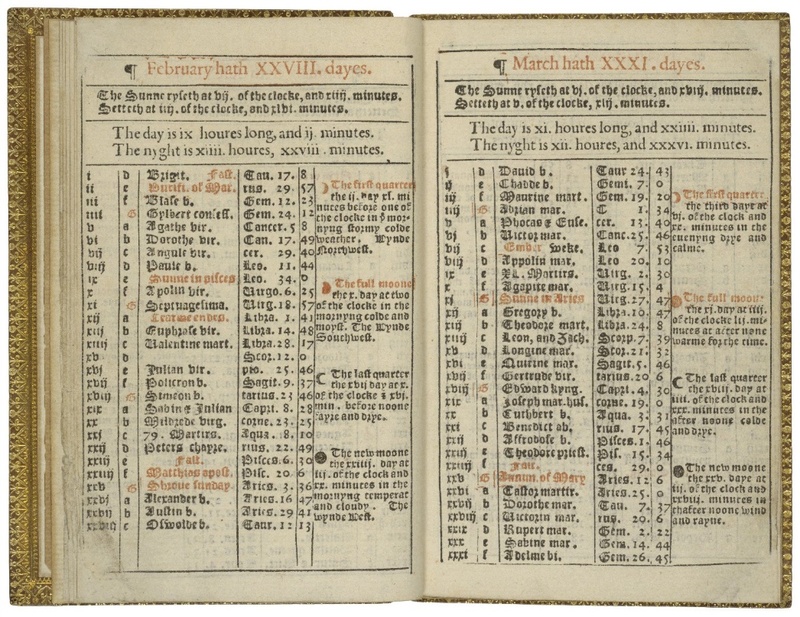 If you know when the Bible was first printed you could search for “bible” as a keyword with a publication date of 1611. You could also try searching for the keyword “authorised” and 1611. (This is the version of the bible that was authorized to be read.) The actual title of this book, as it was printed, is The Holy Bible conteyning the Old Testament, and the New: newly translated out of the originall tongues: & with the former translations diligently compared and reuised, by his Maiesties speciall co[m]mandement. Appointed to be read in churches.” Catalogers have developed a system of uniform titles to more easily identify works that are published under a range of titles; for this work, the uniform title is “Bible. English. Authorised.” If all of that is too frustrating, you can find it by its bibliographic number: STC 2216. 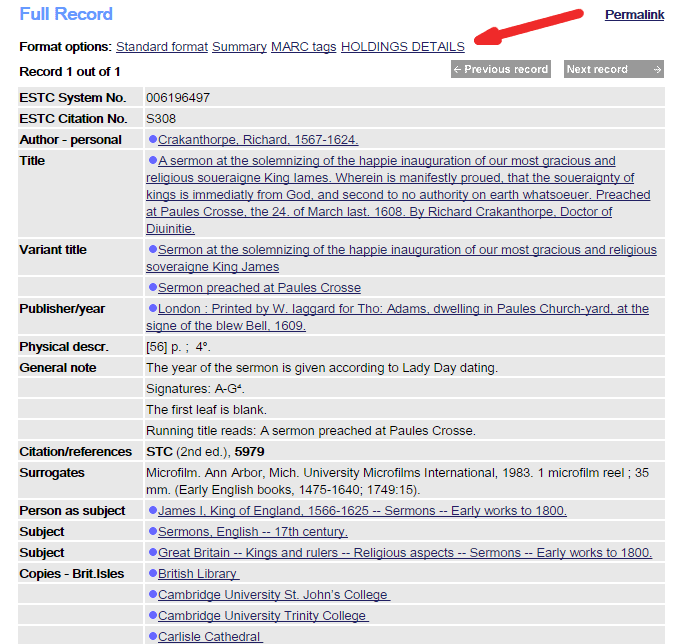 Although there is no search field for bibliographic format, you can find some octavo books by doing a keyword search for “octavo.” This method brings up any items that have “octavo” in their record, including as a date given in the title or imprint, and sometimes in a description in the note field. A better way of searching for a book in a specific format would be to search ESTC (the English Short-title Catalog, http://estc.bl.uk) and follow the links it provides to EEBO records. 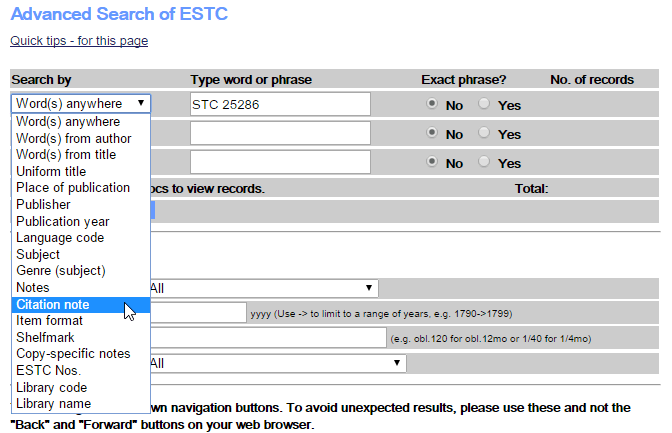 In ESTC’s advanced search, you can search by “item format”: use OR to search for multiple terms, like “octavo OR 8*”. Generally format is recorded by its numerical notation (8° or sometimes 8vo) but occasionally the name will be written out in full (octavo). Using the wildcard * will bring up both 8° and 8vo. EEBO provides images of a single copy of a book. But early modern printed books were often changed during a print run (stop-press change) or had corrections inserted after (cancels). For these reasons, and others, it’s not necessarily safe to assume that a copy of a book is a good stand-in for all copies of that book. To find your book in the ESTC, it’s usually easiest to look it up by citation number—the STC or Wing number provided in EEBO’s records. Using the advanced search option, select “Citation note” from the dropdown list and type in your citation reference. Sometimes you might want further information about an item aside from textual variants. For instance, the image below has some oddities both in terms of what the original is and how it was filmed. The first thing to note is that the book is filmed sideways—in landscape orientation rather than portrait. Why did that happen? Are other books imaged at the same time oriented that way? The second thing to note is that this text seems to be in the middle of the book—you can see the stack of the fore-edges of the pages that came before it. It’s probably part of a sammelband, a collection of different works that have been bound together into a single book. To find out more, we might want to look for other books on the same reel. Is the rest of the book there? Are other items filmed sideways? Since the microfilms were shot and distributed as reels of photographic film, each item in a collection has a reel number and location number, and that identifier is shared on the EEBO record in the “collection and reel number” field. For this book, the collection is STC and the reel number is 1749:15—it’s on reel 1749 of the STC collection and the 15th item on that reel. The previous item would be 1749:14 and the subsequent 1749:16. In the advanced search, there is an option to search by reel location; searching for “1749” will bring up other items on that reel. None of those other books, however, are filmed sideways, nor are any of them also from Trinity Library, where this book was imaged (see the “notes” field in the EEBO record). As we can see this book is held at Trinity College Dublin, we might try to go to Trinity’s catalog record to see if that provides more information about what’s in the book. We can work out what the shelfmark number for this book is by going to ESTC and then we can go to Trinity’s catalog to see if it provides more information there. EEBO identifies which library supplied the copy that they imaged in their records for each item; in the record above, the “copy from” field identifies the holding library as the Trinity. 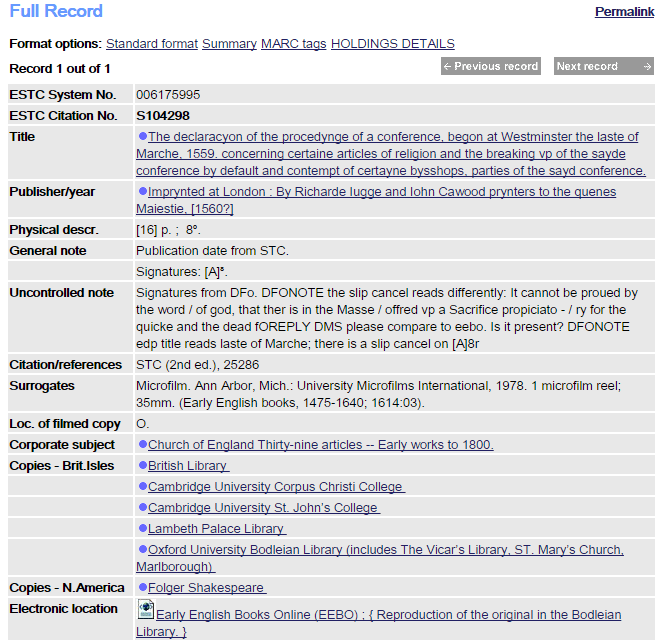 Although EEBO does not provide the shelfmark for the copy, you can often find that information in the “holdings” view in ESTC, which supplies information about all the copies they have recorded. 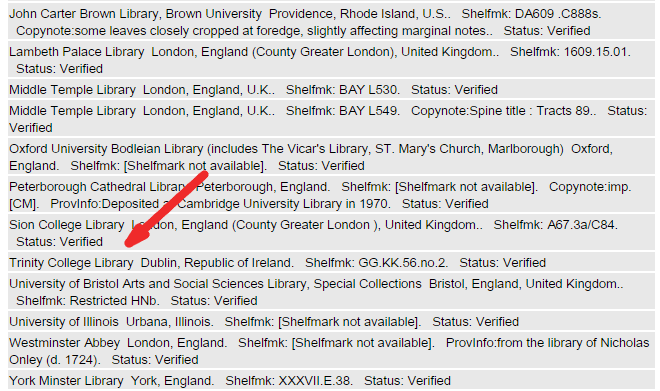 Unfortunately, when you search for “GG.KK.56.no.2” in Trinity’s online catalog (https://library.catalogue.tcd.ie/), there are no hits for it, although there are for adjacent shelfmarks. We’ve hit a dead-end, but it’s important to remember that not all books are cataloged online. In these cases, the next step could be to visit the holding library, if you’re able, or to contact the librarians there to see if they can provide assistance. Sometimes you can run into the opposite problem: a library might hold more than one copy of a book, making it difficult to ascertain which one was filmed. Occasionally there are clues in the images that can help you trace the item. 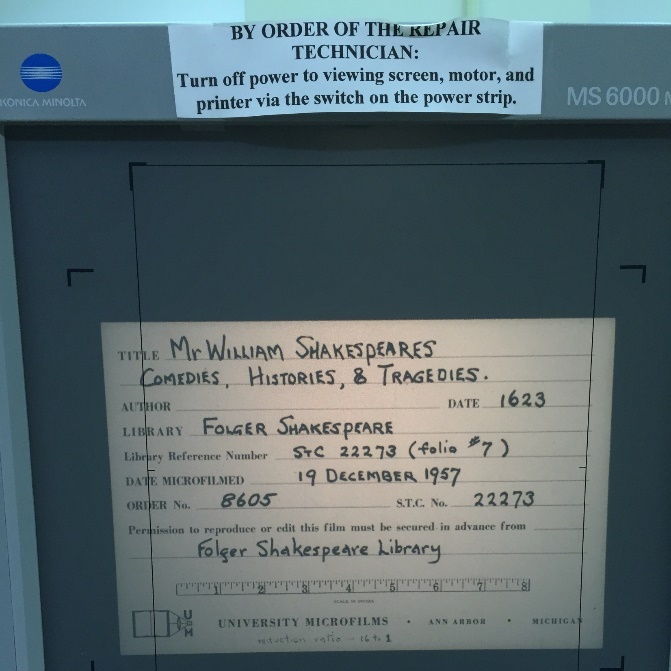 In the case of Shakespeare’s First Folio (STC 22273), EEBO tells us that it’s a copy from the Folger Shakespeare Library (see above), but if you search for “STC 22273” in the Folger’s catalog (http://hamnet.folger.edu; use the “call number (left-anchored)” search option), you’ll see that the library owns many copies of the First Folio. 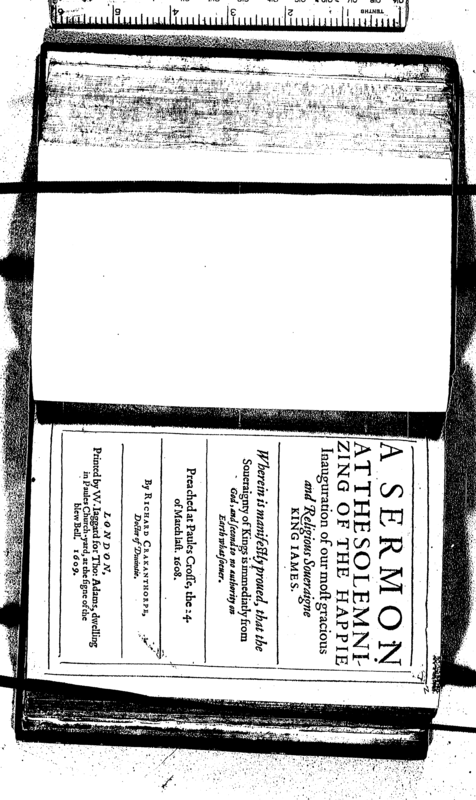 Returning to EEBO’s images, however, you can see that the photographer has, unusually, included the pastedown and flyleaves, and that on the pastedown is a bookplate for “Syston Park.” Doing an advanced search in the Folger catalog for both the call number “STC 22273” and for “Syston Park” in the “Folger Copy Notes” field, you’ll get a hit for copy number 7, which in its record identifies it as the one filmed in EEBO. Frustratingly, the information about which copy was filmed is recorded in the UMI microfilm reels on the target card which typically is the first image filmed of an item, providing information about what is being imaged. As you can see from the picture below of the microfilm reader, the target card provides the copy number and the date it was filmed, but EEBO strips out most of the target cards from the images it provides. 4. What details get lost in an EEBO image? The process of digitizing the microfilm can also introduce changes to the images. 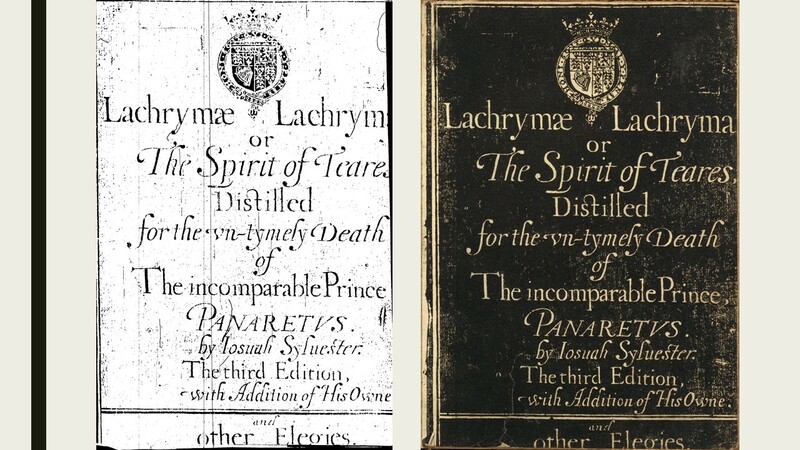 In the case of the third edition of Josuah Sylvester’s Lachrymae Lachrymarum (STC 23578), the white-on-black title page was mistakenly reversed. 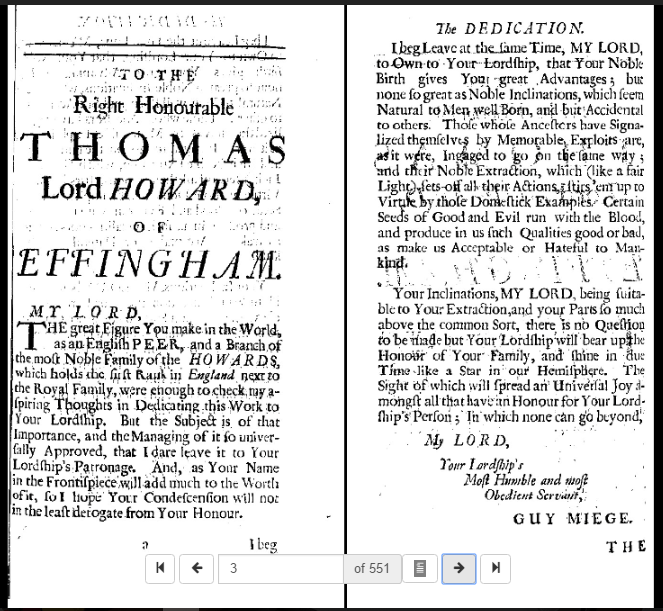 On the left is the title page as it appears in EEBO; on the right is how another copy of this edition appears in the Folger’s digitized holdings. Since the original microfilms show the book correctly, it seems likely that either human error or algorithmic confusion during digitization turned the weird-looking white-on-black title page into a more “correct” (but wrong) image of black-on-white. It’s a mistake that is noticeable to users familiar with the mourning book tradition, or to those who note that having an engraved black-on-white title page in that style is atypical for the early 1600s. But to other users, it’s not necessarily an error that signals its presence. If you look at some other EEBO images of mourning books with white-on-black title pages, you’ll see that some of them are done correctly (STC 23577, STC 2451) while others have been reversed (STC 23576, 6256). 6. What’s not in EEBO and ECCO? STC does not include works without letterpress type; if a book includes both letterpress type and engravings, it is cataloged, but a solely engraved work is not. EEBO, however, does not include facsimiles of bookplates. Wing does not include periodicals, ephemera, or engravings (although some ephemera that wasn’t in Wing has been subsequently added to ESTC). The Eighteenth Century STC does not include periodicals, engravings, music, or maps, but does include ephemera, like bookplates, which are included in ECCO. None of the catalogs that make up the ESTC include foreign books that are not in English, even if they were imported to England. There were a great number of continental books that were read and circulated in Britain, and any study of reading that is based on the ESTC is going to miss a crucial aspect of print culture. Bibliographic data is drawn from ESTC but is not synchronized or necessarily updated with EEBO and ECCO. Gadd, Ian. “The Use and Misuse of Early English Books Online.” Literature Compass 6, no. 3 (May 2009): 680–92. doi:10.1111/j.1741-4113.2009.00632.x. Kichuk, Diana. “Metamorphosis: Remediation in Early English Books Online (EEBO).” Literary and Linguistic Computing 22, no. 3 (May 2, 2007): 291–303. doi:10.1093/llc/fqm018. Mak, Bonnie. “Archaeology of a Digitization.” Journal of the Association for Information Science and Technology 65, no. 8 (August 2014): 1515–26. doi:10.1002/asi.23061.